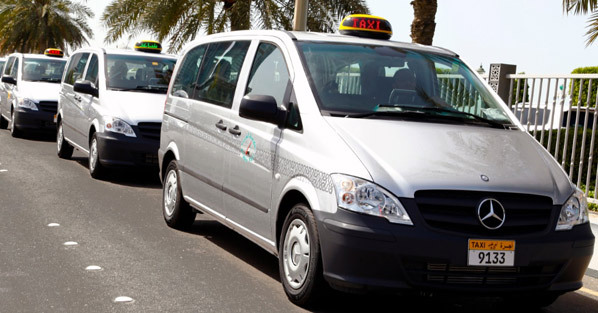 Abu Dhabi’s Centre for Regulations of Transport by Hire Cars has announced the launch of a fleet of 270 new Mercedes Vito Compact taxis, similar to the airport taxis. The launch will undergo an initial trial period to asset the vehicle mechanical and technical aspect as well as the public feedback. The new taxis display a higher level of luxury and spaciousness with leather seats arranged facing each other and rear seats to accommodate five passengers. The taxis are equipped with all the necessary safety features and come complete with a transparent privacy glass that provides the passengers and the driver with a sound-proof privacy. The new taxis will run on eco-friendly green diesel, and will be equipped with an easy-to-use intercom system for communications between the passenger and driver; vehicles will also be equipped with up-to-date Metre data unit. In addition to that, the new taxis are wheelchair accessible via special ramps and fitted with special locks to secure the wheelchair in place for those with special needs to use. Commenting on the launch, Mohamed Darwish Al Qamzi, general manager of The Centre for Regulation of Transport by Hire Cars, said: “We are running this launch trial in line with efforts to provide integrated transport services which reflect Abu Dhabi’s tourism identity and fulfil the needs of all members of society. Al Qamzi also pointed out that the taxi transport companies are providing training for drivers on how to drive the new taxis and use the latest technologies and features on board. The Centre for Regulation of Transport by Hire Cars aims to develop the taxi transport sector to the highest international levels of quality.